What do I do if I'm not ready to move out at closing? Your hunch is correct. The best solution is to rent-back the home for some time, possibly 30-60 days after closing. This solution would eliminate the potential financial risk involved in spending money before having the money to spend. Reader Question: my property is for sale. It has been my primary residence for 40+ years. My Realtor wants to know ‘If an offer were made would I be willing to vacate the premises upon the day of closing?” What if I move all my belongings into storage and the buyer backs out of the sale at the last minute? Is this a good idea when it is only a month until the closing date? I have no idea yet where I will go or stay as I have no other property or house picked out. Should the price the buyer offers influence my decision? Please advise. Jim D.
Monty’s Answer: Hello Jim, and thanks for the question. Your hunch is correct. The best solution is to rent-back the home for some time, possibly 30-60 days after closing. This solution would eliminate the potential financial risk involved in spending money before having the money to spend. Unfortunately, the situation described is one of the common occurrences in real estate transactions today. Another option is to rent an interim home to give time to consider your options and look around. This option requires a double move, as does the storage unit. In terms of the amount of money being offered, be advised to separate the price issue from the occupancy issue. The price for which a home sells is a function of market conditions, the circumstances and motivation of the parties involved, the current history of activity and comments during the home’s offering period and more. A good real estate agent can overcome the occupancy question with the rent-back feature or other practical tactics. Occupancy is just one more negotiation. A seller should pay rent because at closing, the buyer now takes responsibility for a mortgage payment, real estate taxes, insurance and more. When making an agreement with the buyer to rent-back after closing there are a number of issues that should be discussed to reach agreement. Insist these subjects be discussed and agreed upon in writing. This negotiation should become a part of the purchase agreement. Certain states or attorneys will recommend a separate rental agreement. 2. The time and date the occupancy period begins and terminates. 3. The daily or monthly rental rate. 4. How is the rent paid? It is withheld from seller’s proceeds in escrow at the closing of the property sale. 5. If seller moves out early, how is the escrow terminated? Normally, if the seller vacates early, the unspent rent be returned to them on delivery of door keys. 6. A Security deposit to guarantee delivery to the buyer is returned to the seller or forfeited to the buyer if the seller fails to deliver the property as agreed. 7. Who pays what utilities and when, and how is payment guaranteed? Some utilities can be a lien against the property. 8. Who is responsible for maintenance and repairs and what dollar limits are imposed on the amount and types of repairs. 9. Who has keys to the property? When can the new owner have access to the property? What is the reasons buyer seeks access to the property? 10. Are the conditions terminating the occupancy agreement clear and easily readable? 11. 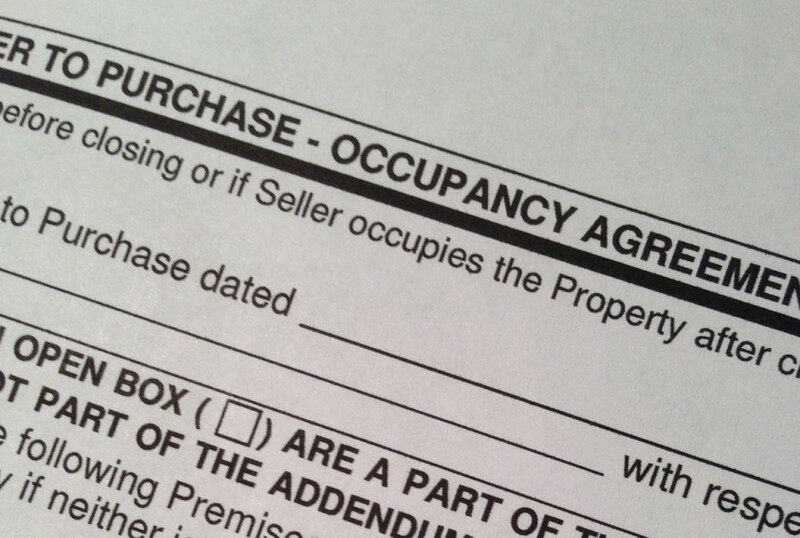 Any other terms or conditions to the occupancy agreement either party requires. There are other potential ramifications for the seller who agrees to vacate at closing when they have not established a destination. When buying a replacement property, an offer subject to the sale and closing of a different property could put them at a disadvantage in negotiating price or a multiple offer situation. To offer to buy the next home without that “subject to sale” contingency drastically increases the financial risk.